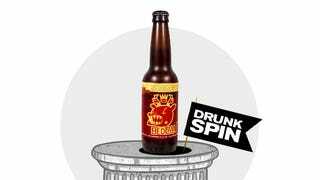 "Best Of" lists are stupid and awesome, and so is beer, which is why I've had such a good time compiling the Drunkspin Beers of the Year. I'll lay that on you sometime next week, but for now, let's confine the arbitrary declarations to just one state. I'm not ready to say that Wisconsin is the finest state in the Union, because I've only spent four days there and have still never been to many of the other potentially great states, including Texas, Hawaii, wherever the other Portland is, and most of the Dakotas. But I can say for certain that Wisconsin is objectively great, and if there are indeed better states out there, then the world is a far richer place than I dared dream. One of the main things that makes Wisconsin great is that when you go there, you don't really have to work: Your wife goes to training seminars while you drink beer. Try it sometime! So while I'm not quite expert in the ways of the Wisconsonian—I've never paid taxes, shoveled snow, or raised a cat there—I do know a fair bit about their beer. That beer tends to be more malt-focused than what you'll find on the coasts, which is A-OK with me. I love hops, but not to the same extent as most of my peers. But I guess a slight bias toward bitterness does show when it comes to choosing my favorite Wisconsin brewery, because Madison's Ale Asylum makes them hoppier than what I found to be the regional norm. But since I acknowledge my limited Wisconsin experience—and also my preference for the styles of beers Ale Asylum happens to excel in—I ran this headline by Chris Drosner, Beer Baron columnist for the Wisconsin State Journal. He didn't exactly endorse my assertion that Ale Asylum is the best brewery in the state, but he conceded that it's not a preposterous claim. He's a big Ale Asylum fan and, when prodded, granted that a reasonable person could prefer it to New Glarus, Capital, Tyranena, Karben4, Lake Louie, or any of the state's other high-end beer-makers. Another thing I'm a sucker for, in addition to hops and states where your only obligation is to drink beer, is Belgian yeast, which is why Ale Asylum Bedlam is one of my favorite new-to-me beers of the year (look for it soon on a list near you!). I stumbled upon this 7.5-percent alcohol-by-volume Citra-hopped Belgian IPA during my first lunch in town, and while I had a couple dozen other good local beers over the course of the week, nothing else left as strong an impression. Bedlam pours light copper, with a large, white head. The fruity Belgian yeast esters and spicy phenols combine for a great balance between banana and clove aromas that blend perfectly with the hops, which provide a slightly funky, earthy note underneath lemon, pineapple, nectarine, and a bit of juniper. The yeast and hop character is joined by a pronounced caramel maltiness that's lacking in a lot of Belgian IPAs, but which is fortunately mandated by Wisconsin custom; this provides an extra dimension that makes Ale Asylum Bedlam one of the best interpretations of one of my favorite styles of beer.